A student who has discovered the knowledge of learning has begun a lifetime adventure. Sometimes the understanding of fundamental concepts alone does not help the students to crack the competitive exams as most of them are objective in structure. Students need rigorous training to familiarize themselves to the style of the exams they attempt. The board exams which are of qualifying and not competitive in nature, do not completely address the needs of testing the students in the objective type forma of questions. To bridge this gap and to enable the students to face the reality of competitive exams, Mapmystep.com has come out with Olympiad & Talent Exams Preparatory Package. Care has been taken to design thought-provoking Application / Skill / Knowledge / Understanding oriented questions. The questions have been reviewed to fill the gaps in problem coverage and to build confidence in the students. They have also been expanded to impart reasoning/logical/analytical skills. This package also complements the additional preparation needs of the students for the regular board exams. All questions are of Multiple Choice type with one correct answer. For every chapter, 5 tests are conducted. This is a unique 5 STEP Process. Presents Test 4 which is a combination of questions answered wrongly in STEPS 1, 2 & 3. 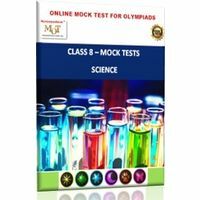 Presents Test 5 Comprising 15 new questions which are a combination of Basic, Challenging and Advanced questions. Each test is for 20 minutes. The 'Review Test Monitor’ would appear in the Tests page after you have clicked on ‘Finish' to complete the test. You can view all the questions with solutions in 'Review Test Monitor. All the tests are backed by interesting and very useful Analysis Reports. It gives the percentage of students who answered each and every question correctly and wrongly. It also gives an idea of your performance level compared to all the test takers. This data changes regularly based on number of users. It gives the percentage of students who choose different options for a question. Know your STRONG and WEAK subtopics in each chapter. Gives the test wise performance on a single graph. A student who has discovered the knowledge of learning has begun a lifetime adventure. Sometimes the understanding of fundamental concepts alone does not help the students to crack the competitive exams as most of them are objective in structure. Students need rigorous training to familiarize themselves to the style of the exams they attempt. The board exams which are of qualifying and not competitive in nature, do not completely address the needs of testing the students in the objective type forma of questions. 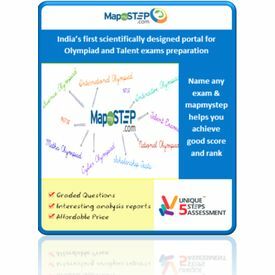 To bridge this gap and to enable the students to face the reality of competitive exams, Mapmystep.com has come out with Olympiad & Talent Exams Preparatory Package. Care has been taken to design thought-provoking Application / Skill / Knowledge / Understanding oriented questions. The questions have been reviewed to fill the gaps in problem coverage and to build confidence in the students. They have also been expanded to impart reasoning/logical/analytical skills. This package also complements the additional preparation needs of the students for the regular board exams. This package is effectively useful for all International/National / Regional Maths / Science Olympiad NSTSE NTSE SLSTSE Various Scholarship, Talent Exams Assessment Exams etc. Test Structure All questions are of Multiple Choice type with one correct answer. For every chapter, 5 tests are conducted. This is a unique 5 STEP Process. STEP 1: Presents Test 1 Comprising 15 Basic level Questions STEP 2: Presents Test 2 Comprising 15 Challenging Questions STEP 3: Presents Test 3 Comprising 15 Advanced Questions STEP 4: Presents Test 4 which is a combination of questions answered wrongly in STEPS 1, 2 & 3. STEP 5: Presents Test 5 Comprising 15 new questions which are a combination of Basic, Challenging and Advanced questions. Note: Not attempted questions will not come in 4th Test - Un attempted questions are not served in this test Student Each test is for 20 minutes. The 'Review Test Monitor’ would appear in the Tests page after you have clicked on ‘Finish' to complete the test. You can view all the questions with solutions in 'Review Test Monitor. All the tests are backed by interesting and very useful Analysis Reports. Question Wise Analysis: It gives the percentage of students who answered each and every question correctly and wrongly. It also gives an idea of your performance level compared to all the test takers. This data changes regularly based on number of users. Option Wise Analysis: It gives the percentage of students who choose different options for a question. Subtopic Wise Analysis: Know your STRONG and WEAK subtopics in each chapter. Overall Analysis: Gives the test wise performance on a single graph.